Yes. Its “racist” when you object to Mohammedan savages murdering their wives in front of their children. Don’t get uppity, you racist-bigot-Islamophobe, you! People, we have surpassed peak ABC. We have now entered a dimension so whacked that it defies understanding on any level. A radicalised Muslim who removed his wife’s right eye before slaughtering her in front of their children told police it was “normal” behaviour in the Middle East. The brutal killer, who cannot be named to protect the identities of his three children, is facing life behind bars after he pleaded guilty to the horrific killing in June last year. Assimilation might have saved that woman’s life. Too bad it’s racist. 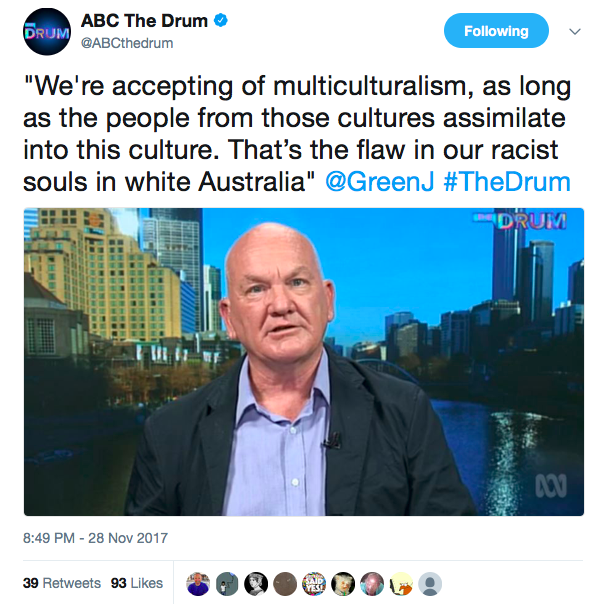 Australia is one of the least racist countries. Send these characters to live in India, Africa, Pakistan or Indonesia, just to name a few. Racism is alive and well in almost every culture. Note to anyone who cares: Islam is not a race. Liberals would argue that all “cultures” are equal, without even having the brains to try to define what a “culture” is. But “culture” is merely the generalized moral EDUCATION level of any given society, based on perhaps outmoded or even criminal traditions which developed in the past. Objective morality doesn’t change, but merely situational and circumstantial definitions of it do – and in fact most if not all primitive tribal societies defined morality in a wholly subjective, hypocritical, us-vs-them and might-makes-right manner, wholly inapplicable to an united humanity in today’s global world. Islam is exactly such a tribal-based “cultural” model, and as such, it is wholly hypocritical and criminal in nature. They would also probably then pretend that in the case of individuals, the education level of a third-grader be legislated as “equal” to that of a Ph.D candidate in any given specialty, much less that such a false conflation be backed up by an imposition of physical force (fines, jail, etc)? !That the same test be used to grade both the 3rd-grader AND the Ph.D candidate?! That would be kind of unfair to at least one of them, no? The fact is that the VAST majority of muslims in islamic countries conduct their lives today in as an exactly imitiative manner of Muhammad’s 7th Century living standards as it is possible to do – because they have been indoctrinated since birth to believe that he was the literal Messenger of GOD himself, and that his Qur’an is the Perfect Word of GOD. Muslims actually and actively do consult their (not to them “ancient”) texts for almost everything, because the Qur’an mandated a micro-management of ALL aspects of their lives, down to which hand they should wipe their behinds with (and which size and shape of stones they should wipe with, and which variety of dirt they should use to bathe in, too)! How to dress, what to eat, it covers EVERYTHING and asserts that if they don’t obey it, the others must kill them for it (as seen in Qur’an Sura 4:89). It’s why their own families often “honor” kill the muslimas for taking off their hijabs here in the West. And why shouldn’t we judge other (not to mention all) religions?! Religions are all lies – they are in fact really only statements of subjective opinions, put forth as FACTS. We can – and should – condemn all muslims for the sins of being members of a global crime-gang whose clearly and quite officially stated mission is to VIOLENTLY extort, enslave and destroy ALL other religions and cultures in the world, until it alone remains – because that is actually how the LAW works: simply generally being a member of a gang whose motives are so openly proclaimed, makes one a representative of the general threat the gang presents, even if one commits no other specific crimes one’s self beyond that general gang membership (RICO, etc)! There are no such strictures or tenets demanding or even merely advising violent global conquest in any of the other religions on earth, and there never have been. Only in islam!